Although we do not eat much meat at home, one of my favorite foods will always be a thick, juicy cheeseburger. Jill, on the other hand, does not eat any red meat at all (well, maybe she will steal a small bite of bacon from my plate on occasion). Despite the general lack of red meat in our home, I figured it was time to light up the grill and kick off the summer season with some delicious burgers. While in her office a few weeks ago, my co-worker, Erin, gave Earth Fare’s bison and smoked gouda burgers rave reviews and insisted that I buy some and grill them. So, I did. The burger was made with bright red ground bison meat and shredded smoked gouda cheese. The burger was visibly fresh. For Jill I was hoping for a fresh salmon burger or a fresh turkey burger. Not offering these options at Earth Fare, I settled on some Blue Horizon Wild salmon burgers from the freezer case. 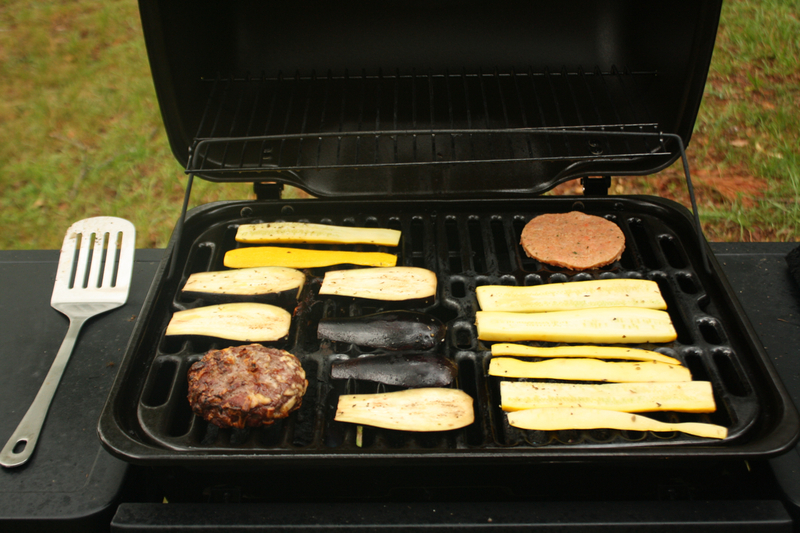 To go with the burgers, I grilled one golden zucchini from my garden and an eggplant. I chopped the grilled veggies up, mixed them with a freshly diced tomato, and seasoned them with some herbs de Provence to make a ratatouille-inspired salad. I also made kale chips out of some sesame kale from the Earth Fare deli. The bison and gouda burger was as delicious as Erin promised it would be. Topped with a little spinach and some ketchup, and served on a ciabatta roll, the burger was better than any burger I’ve has in a very long time. The smoked gouda mixed into the meat really added to the flavor of the burger. I didn’t try the salmon burger, but it looked good and Jill said it was tasty. 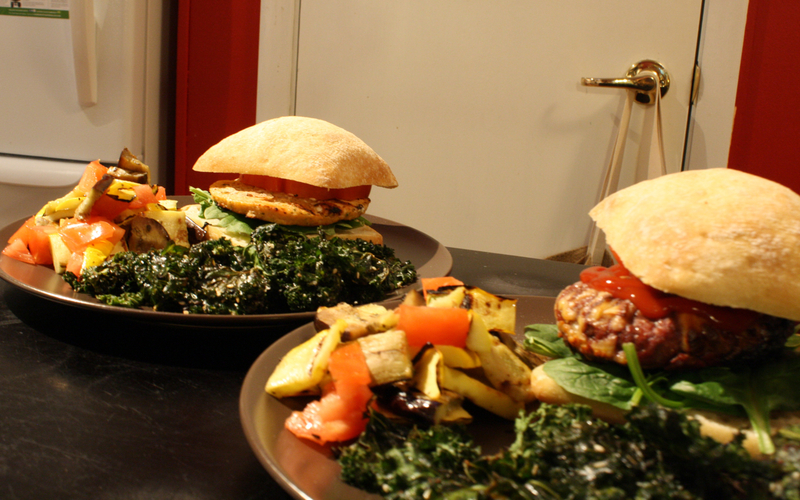 I cannot think of any better way to welcome in the summer than burgers and vegetables on the grill.